Most grill and smoker designs have been around for decades, even centuries. It’s not often that a manufacturer comes along with something radically new. Well, Kalamazoo Outdoor Gourmet has, and I got to test drive it during the taping of Project Smoke, Season 3. (We used it to smoke pastrami bacon and Korean pulled pork shoulder.) It’s the Kalamazoo Cabinet Smoker and it’s simply one of the most intriguing fusions of high design, ingenious engineering, and primal smoke and fire on Planet Barbecue. You’ve probably heard of Kalamazoo—the manufacturer of super premium grills that perform like Ferraris—and are priced like Ferraris, too. Kalamazoo’s first grill—the Hybrid Fire—burns gas, charcoal, and/or wood; it starts at $12,495 for the smaller of the three built-in models. The Gaucho Grill, Kalamazoo’s Argentinean-style grill/rotisserie, is equipped with a flywheel to raise and lower the rotisserie spit and grill grate and ranges from $19,995 to $26,095. Kalamazoo came out with a new cooker this year, a gravity-fed smoker that fits under the counter of your outdoor kitchen. Its sleek stainless steel exterior conceals a remarkably capacious smoke chamber, sophisticated electronics, and a surprisingly simple gravity-fed smoke generator. Hot charcoal embers fall onto a pan of hardwood, producing fragrant smoke and heat that you can control almost to the precise degree. Like the Gaucho Grill, the Cabinet Smoker is the brainchild of Kalamazoo designer Russ Faulk. I like to think of Russ as the Jonathan “Jony” Ives of barbecue. I wanted to know how this distinctive smoker came into being. Our roots go back to 1906, when we were incorporated as Kalamazoo Sheet Metal by an eccentric inventor. As custom fabricators through the decades, we developed a specialty in stainless steel processing equipment for the pharmaceutical and dairy industries. Both require a very high standard for finishing with no nooks, crannies or imperfections that would make the equipment more difficult to keep clean and hygienic. In the mid 1990’s, Kalamazoo started making some rather unique gas grills. New ownership in 2005 led to a rebirth. We renamed the company Kalamazoo Outdoor Gourmet, focusing all of our craftspeople on building outdoor cooking and entertaining equipment. When did you come on board? What was your mission? How has it evolved? I joined in 2005. My background is in design and my mission was to help build Kalamazoo Outdoor Gourmet into the recognized leader in outdoor cooking and entertaining. In 2008, I had the opportunity to take the reins in R&D, and I have never looked back. 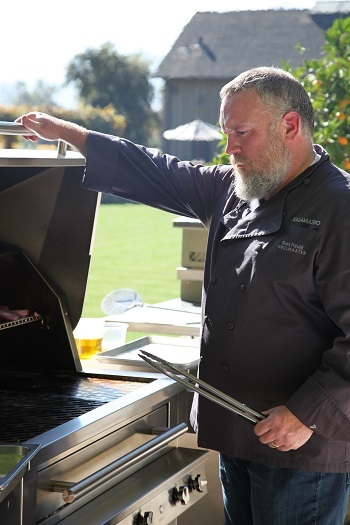 I have had a direct hand in the design of all of our cooking products, including the Hybrid Fire Grill, the Gaucho Grill, the Artisan Fire Pizza Oven, and our new Smoker Cabinet. What is a gravity smoker? How does it work? A gravity-fed charcoal smoker is pretty unique among the wide range of smokers out there in the world. The key aspect of its engineering is the way airflow is controlled, allowing only the very bottom part of a column of charcoal to burn. As the charcoal is consumed, gravity feeds more charcoal down to take its place. The pit itself is insulated, making this type of smoker very efficient. A little charcoal lasts a long time. For more smoke and flavor, wood chunks are placed in the ash pan below the fire grate where the charcoal is burning. The embers from the fire fall on the wood, causing it to smolder. Why did you choose this particular design? We love gravity fed charcoal smokers because they are a simple and elegant solution for achieving long smoking times with fantastic temperature control—all while using a live fire that does not need much tending. There are other technologies for achieving long-lasting and predictable heat, but our love of live fire cooking made our choice clear. We did not invent the gravity-fed charcoal concept. We took this tried-and-true technology and transformed it into a cabinet that is right at home in the outdoor kitchen. I think it is the most attractive smoker on the market. It works seamlessly with our modular outdoor kitchen system. We also offer it as a freestanding unit. That is the version you cooked with on Project Smoke. The freestanding smokers are on wheels and have large handles. We top the freestanding smokers with a high-performance porcelain top that can withstand the elements. What are some of its other unique features? A pit computer comes with the smoker. It monitors the temperature three times per second and adjusts the intensity of the electric blower that stokes the fire. This precise control helps reduce unpredictability in the all-important time and temp equation for your barbecue. Inside the pit are three large adjustable shelves that can easily hold nine full slabs of pork ribs without any fear of overcrowding. If you want to add two more shelves you can bring that feast up to fifteen whole slabs. What were the challenges of designing the Kalamazoo smoker? The biggest challenges have to do with making it work as a built-in cabinet. The fire and the pit both have to be accessed from the front. Typically, the fire door and the air inlet are on the side or back of a charcoal smoker, so we had to re-engineer the whole system to work toward our goal of a cabinet. The airflow and the insulation all had to be rethought. As a cabinet, under a countertop, we had to manage the heat in different ways than is typical. Another trick, and one I hope our clients appreciate, was to merge the chimney and the chute for loading the charcoal into a single structure. This detail allows for just one countertop penetration, making the smoker easier to install. The last detail you might find interesting has to do with keeping out pests. Particularly because our smoker is designed to be built into the outdoor kitchen, this was important to address. We moved the grease pan to the inside of the pit, which is totally sealed when the smoker is shut down. The pit door and charcoal chute door are sealed with gaskets and powerful magnets. The air entry is closed by a brass ball valve. And the chimney shutter closes tight. Once you shut down the pit, you can be sure you’re not sharing any tasty barbecue leftovers with any unwanted guests inside. What does the cabinet smoker do best? 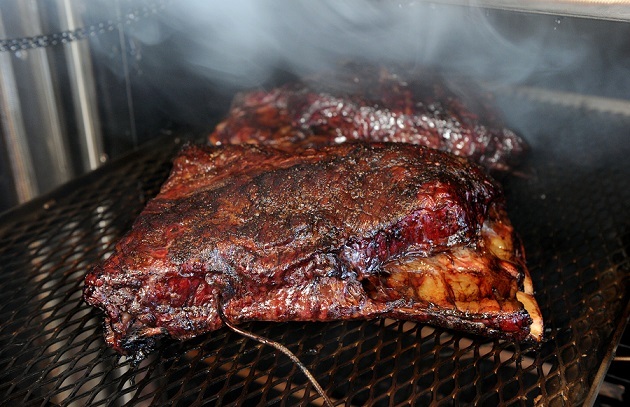 What our smoker does best is low-and-slow traditional American barbecue. It is amazing how long it will hold temperature at 225°F on a single load of charcoal. We promise up to 16 hours, but those are winter numbers and not necessarily the best quality charcoal. 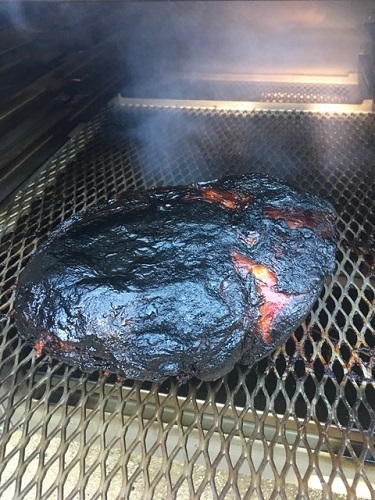 When I use our Kalamazoo Quebracho Charcoal in the summer, I can smoke a brisket for 21 hours without reloading. One thing I think a lot of people have not really thought about is how important the weight of a smoker can be. Our smoker weighs more than 400 pounds. That is more than just a sign of high quality, it also helps it hold heat, and maintain a more consistent temperature. The same holds true for our grills. It is one of the defining performance characteristics. What should someone keep in mind the first time using it? A little smoke goes a long way in such an efficient smoker. I suggest using large wood chunks in the ash pan. You’ll only need one or two at a time, and you should swap old out for new about every 45 minutes for shorter smokes like baby back ribs, which I smoke for 5 hours at 225°F. How does using this smoker differ from using other smokers? The biggest difference is the way the fire and smoke interact—the fact that charcoal is used for heat, and that the wood is placed under the fire and not in it. What are some of the more interesting dishes you’ve cooked in it? People have really enjoyed the Smoked Buffalo Cauliflower that I have served a few times at events in our Chicago Culinary Center. Smoked lasagna is also pretty interesting. My favorite by far is beef ribs. Brisket is a close second, but the ribs obviously take a lot less time. I’m not one to use a lot of barbecue sauces. Most of my barbecue is just a flavorful dry rub and smoke. I recommend using large wood chunks with the smoker. The larger chunks will smoke longer and are less likely to combust than smaller chunks. Apple, cherry and oak are the varieties I use most, but that is very much a matter of personal preference. I also enjoy peach and pecan—the latter is particularly nice with pork. So how much does the Cabinet Smoker cost? Kalamazoo products are definitely an investment in quality and performance. The two models of Smoker Cabinets range from $10,995 to $13,495.